Harry Potter Etymology- Historic Pure-blood Families | Snip! From this tree, we find that James was actually Sirius’s third cousin by marriage, once or twice removed. Similarly, Arthur Weasley was Sirius’s fourth or fifth cousin by marriage, many times over. I start at the Peverell Brothers, because really, they seem to be at the root of everything. The Peverells, I believe, did not meet Death personified. I agree with Dumbledore when he says that they might have been very accomplished wizards, who used their talent to craft the Hallows. Antioch- His name may be a reference to the city of Antioch, a chief centre of early Christianity. He possessed/created the Elder Wand. Cadmus– In Greek mythology, Cadmus was a Phoenician(a reference) king, and the founder of the city of Thebes. The king actually had a brother called Phoenix. His wife, Harmonia received a necklace as a bridal gift. This necklace brought ill-fortune to all those that possessed it. He once killed a Sacred Dragon, and suffered the consequences. He ultimately was turned into a snake, because of a prophecy. Cadmus Peverell, is of course, a forefather of Voldemort. He possessed/created the Resurrection Stone, again related to something Voldemort feared- death. The allusions pass many levels in this bit of history. Ignotus(12th Jul 1214– 18th May 1291)– Another clever use of Latin, meaning Unknown. It symbolizes the Invisibility Cloak, for obvious reasons. Ignotus is Harry’s ancestor through James. Gaunt is an English word that means haggard, emaciated, weak, thin, desolate- possible references to the effect of inbreeding. Marvolo- He is the descendant of Salazar Slytherin and Cadmus Peverell. Malvolio in Latin, the root of the word malevolent means ‘ill will’. Malvolio was also the name of a character in Shakespeare’s Twelfth Night(for all you teenage romcom movie fans, twelfth night was superbly funny and is the inspiration for the movie She’s the man). He is Puritan who despises games or anything remoetely fun. Perhaps Rowling was inspired by this character, considering how prejudiced Marvolo Gaunt’s character seemed to be. Morfin(1925-1943)- The name could be a variation of Morfey, an Anglo-French surname meaning ‘ill-fated’. I personally wish it had something to do with Morphine, but considering how historically significant the characters’ names are, I don’t think the drug was Rowling’s idea at all. Merope(1907-1926)- Merope is the name of the faintest star in the star cluster Pleiades, (whose name itself is a combination of her parents’ names- Atlas and Pleione) in Greek mythology. This Merope was a nymph who married a mortal, and bore him a son. Merope Gaunt’s marriage to a Muggle may be an allusion to this marriage, and both suffered a resulting “fading away”(Merope, the Star became the dullest of the 7 stars because of the shame she brought upon herself, and Merope Gaunt’s family line faded). Both Meropes faced mortality after their respective marriages. Also, Merope of mythology was the seventh sister, and seven is the most magically powerful number, perhaps alluding to her incredibly powerful son, who would later plan to split his soul into seven pieces in an attempt to achieve immortality. This is my favorite bunch of Purebloods when it comes to nomenclature since Astronomy is also one of my passions. The entire Black family is named after stars, constellations and galaxies. Sirius– This is an obvious connection. Sirius, the Dog-star is the brightest star in the night sky. It is located in the Canis Major, or the Great Dog constellation. When you study the night sky, Sirius is used as a reference point. Scandinavians called the star Lokabrenna, meaning “Loki’s torch”. Loki was a trickster god in Norse mythology(the same one portrayed in the Marvel comics and movies), a possible allusion to Sirius’ days of mischief-making. My theory is that Rowling thought of the werewolf, then friends keeping him company, then a possible large dog, then the romantic notion of the dog being Harry’s godfather, and his name being Sirius- in that order. She might have then worked backwards for the rest of the family. Sirius’s transformation into a dog is symbolic of his faithful nature towards his friends, as evident from his touching exchange of dialogue with Harry in the climax of the third book. Regulus– It is the brightest star in the constellation Leo. The lion’s bravery could be symbolic to Regulus working up the guts to break away from the Death Eaters and destroying a horcrux. Andromeda – It is the name of a galaxy and a constellation. Andromeda, Sirius’s favorite aunt, was from Slytherin house and married a muggle, Ted Tonks- probably the first and only Slytherin to do so. Bellatrix– It is a star in the constellation Orion. Orion is traditionally depicted as a hunter, which might be in reference to Bellatrix’s ability to kill (even her own cousin) without guilt. Alphard is the brightest star in the constellation Hydra. Arcturus is the brightest star in the constellation Boötes the Herdsman. Cassiopeia, Cygnus and Orion are constellations. Phoebe is perhaps associated with another name of the sun god Apollo, Phoebus. Pollux is a star in the constellation Gemini. Phineas Nigellus– The Hebrew name Phinehas, derived from the Egyptian name Pa-Nehasy, means “Nubian” or “black man.” Pescennius Niger, as we saw in the previous post, was a Roman usurper (in competition with Septimius Severus (Severus Snape) and Clodius Albinus (Albus Dumbledore) perhaps alluding to the three headmasters). Nigellus is Latin, meaning “little black.” Taken altogether, his name appears to mean “Black Black Black,” or perhaps the forerunner of all that is Black. Nymphadora(Tonks)- Nymphadora means “Gift of the Nymphs.” Nymphs are nature spirits in Greek mythology who rule trees, streams and the ocean. During the Renaissance, northern Europeans equated the classical nymphs with their own legends of elves. If we therefore read “gift of the nymphs” as “gift of the elves”, this echoes the ancient myth of babies stolen by elves and replaced by hideous monsters called changelings. The metamorphic Tonks could be described as a “changeling”. ‘Nymph’ is also the name of the immature stage of a dragonfly or damselfly before it moults, before metamorphosing into a winged adult. This could be a reference to her metamorphosing skills. A ‘Tonk’ literally means, ‘a fool’, ‘a powerful hit or strike’, in reference to Tonks’s clumsiness. Narcissa –She is named after the flower Narcissus which is a daffodil. It could also come from the adjective narcissistic, referring to vanity, elitism and obsession with self. This seems a more likely explanation for such an unusual name. It could be allusion to her(in the seventh book) no longer being ‘selfless’ as the other Death Eaters, but being selfish and finding out about Draco and lying to Voldemort about Harry. Other exceptions include Eduardus, Ella, Elladora, Belvina, Cedrella, Isla, Lucritia, Lycoris, Marius, and Sirius’s mother, Walburga Black. Malfoy in French, derived from mal foi means ‘unfaithful’. There could be an underlying reference here to Narcissa Malfoy’s betrayal, although I think it’s unlikely. Lucius– The name is related to Satan’s first name- Lucifer. It could also be influenced by the character Lucius in Shakespeare’s Julius Caesar. Lucius was Brutus’s servant and was the leader of the conspirators who plot and kill Caesar, much akin to his role in plotting with Voldemort against Dumbledore. Draco– Draco’s name, like those of many members of his maternal family, the House of Black, is derived from that of a constellation. Draco is also known as the Dragon; Draco translates into “dragon” in Latin and “serpent” in Greek. The constellation is connected to multiple legends in Greek mythology; the dragon killed by Cadmus before he founded the city of Thebes is one. In Roman legend, Draco the dragon was killed by the goddess of wisdom, Minerva, and tossed into the sky. Another connection with him being a Death Eater, is the fact that Lucifer/Satan is referenced as a Dragon in Christian Theology. This seals the purposeful connection in the names of the father and son. In addition, Draco was the name of an Ancient Greek legislator whose laws were notoriously harsh. The word draconian, meaning “unusually severe or cruel”, is derived from his name. Astoria Greengrass(wife of Draco Malfoy) seems to have been named after London Astoria, a music venue in London, or the Waldorf-Astoria Hotel in New York. Despite sounding very unlikely to be true, it is of popular opinion that the once-mentioned character is named after either of the hotels. However, the name has its roots in Astera or ‘Star Maiden’, probably as a tribute to her husband’s maternal family. (J. K. Rowling has said that she chose to have Draco marry someone other than Pansy Parkinson, who seems to have been his girlfriend during his adolescence, because she always hated Pansy, who represented “the girls who teased me when I was at school“. She has referred to Pansy as “the anti-Hermione”). Astoria’s sister, Daphne is named after the maiden that was chased by the Sun God, Apollo. Prewett -The surname Prewett is Welsh in origin. It is derived from the Middle English word prou, meaning “brave” or “valiant”, and the suffix “-et”, which implies smallness. Thus, it is believed to be derived from a nickname for someone small, but brave. I suspect it has less to do with the size and more to do with how much in the forefront a person is. A Prewett is not a ‘big’ player, but is definitely brave and valiant. The family’s known members are the famous siblings- Fabian, Gideon and Molly(now Weasley). The brothers were members of the original Order of the Phoenix, and were killed in battle by the Death Eaters. Fabian and Gideon are the two members who are described by Moody as having fought bravely. It took five Death Eaters to bring them down, one of them being Dolohov. It is therefore fitting that Rowling names them after warriors. Fabian- The name is a big reference to the Delayer, Fabius Maximus. Maximus was roman general and politician, most famous for developing the Fabian Strategy of Warfare. Incidentally, or coincidentally, Maximus’s full name is Quintus Fabius Maximus Verrucosus Cunctator, where Verrucosus is symbolic of a wart he had on his upper lip. This might have been an indirect or an unintentional(most likely) reference to Hogwarts. Gideon – It is a Hebrew name, possibly meaning “mighty warrior”. There is a figure in the Bible known as Gideon who is a judge known for his faith and sense of justice. Although it is not mentioned whether Fabian and Gideon were twins, the movies depicted them as twins(they were played by the same actors who played Fred and George); and Rowling acted as consultant at many stages during the production of the 8 movies. It is possible that Molly named her sons with names starting from the same letters as her brothers- ‘F’ and ‘G’, to honor her brothers. Molly- Molly means ‘sea of bitterness’, which is what she turns into when angry. It is a diminutive form of the name Mary, which symbolizes [Jesus’s] mother. Molly Weasly is a matriarch and is a very protective, affectionate and tender character. But the most becoming root of her name seems to be from mollycoddle, which means ‘to pamper or overprotect’, and that, we all know, is definitely what she is! Hermione’s patronus is an otter, which is in the same family as the weasel. This, as well as the fact that the Weasleys live in Ottery St. Catchpole, may have foreshadowed her marriage into the family. 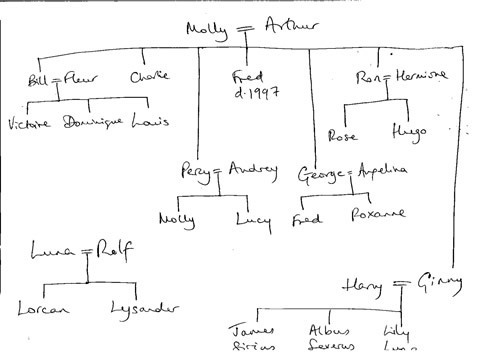 There appears to be a pattern in the Weasley family of members being named after figures in Arthurian legend. Arthur, of course, shares a given name with King Arthur himself. The World Book says, “There are two versions of the events that led to [King] Arthur’s death. Both say he fought a war against Roman emperor Lucius.” I do not think that was a coincidence! Arthur Weasley was originally intended to die in either the fifth or seventh book (particularly when Nagini attacked him), but J. K. Rowling decided against it, because he was “one of the few good fathers in the series.” Lupin and Tonks, two other ‘good parents’, were killed off to compensate for this. Percy is a diminutive of the name Percival, which was the name of one of Arthur’s Knights of the Round Table. It can also be short for Perseus, which is derived from Ancient Greek, meaning “destroyer.” It could possibly be clues for him destroying his relationship with his family. Additionally, ‘Percival’ was a name reserved only for the upper class of Britain in the days of the Monarchy. Later, the British commoners were allowed to use a version of this name – ‘Percy’; Percival itself was still not allowed. By being named Percy, the name plays off our Percy’s family roots as a “poor commoner”. Ginny‘s full name is Ginevra, the Italian form of the name Guinevere, who was Arthur’s queen. Ginny is also a diminutive of Virginia, which means ‘as pure as a virgin’. “Ginevra” is the Italian word for juniper, which in herb lore is used for purification. Meanwhile, we also have a character named Lily, which symbolizes purity. A possible Oedipus Complex? Rowling says that Ginny’s patronus is a horse. Fred is generally considered a short form of Frederick. In German, frid means ‘peace’, andric means ‘ruler’- so a peaceful ruler. Fred is also a diminutive of Alfred meaning ‘Old Peace’. In Norwegian, Danish, and Swedish, Fred means ‘peace’. I feel the ‘peace’ is an allusion to the fact that Fred dies. Rowling stated that she knew from the very beginning that Fred was going to be killed in the series. George might have roots in Saint George, a noble soldier turned martyr from Rome, who became a saint after the Crusades. For a family named after weasels, there sure are many fighters in here! Other famous namesakes are first American president George Washington, two kings of Greece, and explorer George Vancouver. It was also the pen name of English writers George Eliot and George Orwell. Fred and George deserve a whole section to themselves. One of the most famous composers, Handel(link to his very popular chorus of Hallelujah- http://www.youtube.com/watch?v=lG6qx-CAIzA)’s full name is George Frederic Handel. The only times the twins have been apart, they have been injured- when George loses one ear, and when Fred is killed. Incidentally, George the Third became King because of the early demise of Frederick, Prince of Wales. George III was also deaf in one ear. Since George loses an ear, I feel this is where the idea for the twins’ names came from. Angelina Johnson, who goes to the Yule Ball with Fred, later marries George and they have two children- Fred Weasley II and Roxanne Weasley. Roxanne, again, was the name of the first wife of Alexander the Great. Lastly, the twins were born on the 1st of April, and we all know how they turned out to be! Bill is an extremely obvious one- short for William, Bill’s real name. How many kings do we have named William- William, William II, William III and the current Prince William.William comes from the Germanic name Wilhelm, which can be broken into wil ,”will, desire” and helm, “helmet, protection”, again symbolizing a warrior and referencing to Bill working as a curse breaker in Egypt. Charlie is also a simple diminutive of Charles, Charlie’s real name. We have had Charles I, Charles II and the current Prince of Wales- all kings(and a future king). The name Charles comes from the Germanic name Karl, which was derived from a Germanic word which meant “man”. However, an alternative theory states that it is derived from the common Germanic element hari meaning “army, warrior”. Also, Aunt Muriel had a cousin named Lancelot, who was one of Arthur’s knights, though it should be noted that Muriel is Molly’s aunt, so Lancelot might be a Prewett. By the conclusion of the series, the Weasley family is the only known pure-blood family to have several male heirs. Unfortunately, there’s nothing remarkable whatsoever about the four known Potters- James, Charlus, Dorea(previously Black) and Harry. Potter, Rowling says, was always a ‘favorite name’, and Harry was named after a childhood friend. I could go into how it is a derivative of Henry(just like the current Prince Harry, whose real name is Henry), but it would be inaccurate and pointless. Potter is a very common English surname. The most interesting tidbit I came across was this-“Potter’s Field is the name for a burial ground for the unknown or unclaimed dead, particularly soldiers and orphans; the Potter family had many members that fit that description.” It was speculated widely that Harry was a descendant of Gryffindor, but Rowling later discredited this in an interview. Gryffindor is the only founder who doesn’t seem to have a lineage (Slytherin was the ancestor of the Gaunts; Hufflepuff, of Hepzibah Smith; Ravenclaw had a daughter Helena). The chart (first link) is wrong. Callidora Black was not Frank’s mother, his mother’s name was Augusta. Ah, thanks for pointing that out! I can’t seem to find one, do you have a link to a correct family tree image? Ah, thanks! I had totally forgotten. Will update the post. Edit: like Cassidy says, it’s actually William, not Bilius. Actually, no. Bill is short for William. His full name is William Arthur Weasley. Ron Weasley’s middle name is Bilius, as stated in the book. Yes, I confirmed that, which is why I didn’t edit the post. Thanks for the comment! Copyright © 2019 Sandhya Ramesh.All rights reserved.